At first glance, the Asgardia project sounds like a concept pulled straight from science fiction. Announced last week by a group of scientists and entrepreneurs, the project hopes to create a new "space nation" that will be founded on science and exploration and its intent is to foster peace and provide a platform to protect Earth. "Asgardia is the prototype of a free and unrestricted society which holds knowledge, intelligence and science at its core along with the recognition of the ultimate value of each human life," the project's website writes. "You can join like-minded people on this new exciting step in fostering an extended future for humankind." Exactly how this will be achieved is vague, but the founders of Asgardia are accepting applications to become "Asgardians" and, at time of writing, the project's website says that they have received nearly 400,000 applications. So, what will Asgardia look like and how will it be located in space? Asgardia, which is named after a mythical world that is inhabited by Norse gods, appears to be based on the "micronation" model where a self-proclaimed nation declares itself an independent entity. By the founders' reckoning, if tens of thousands of people join Asgardia, the United Nations will be compelled to recognize it as a sovereign nation. That's the plan anyway. But what will Asgardia actually be? That's currently hard to decipher and, according to the project's website, the "technical details" will remain vague for now. The only time-sensitive goal is that they hope to put a nondescript satellite into orbit in 2017 in time for the 60th anniversary of 1957 Sputnik's launch. Anyone on Earth can apply to become an Asgardian, so long as your country allows dual citizenship because, for now, a physical Asgardia nation (or space station?) doesn't actually exist and you're stuck where you are. It's little more than a philosophy for now, but it has some seriously lofty goals as being Earth's protector and has aims to be a state where free thought rules and science leads the way. It hopes to foster a very admirable "Star Trek"-like culture by breaking out of the mold and creating a new, futuristic space governance model. Like any nation, Asgardia hopes to have a flag, anthem and insignia. It also has some founding principles, but this is where things seem to get a little ropy. On the project website, Asgardia is envisioned as a "platform" to protect our planet against seven identified "space threats." Some of these threats are bona fide threats, but humanity isn't exactly sitting idly by just waiting for Asgardia to be launched to protect us. The first space threat identified is "sun storms and flares, known as coronal mass ejections." Granted, space weather is a significant problem for communications satellites and solar storms have been known to knock out national power grids. Though we need to get better at understanding how the sun generates some of its most powerful flares and coronal mass ejections, space weather forecasters are currently pretty good at predicting when an event will happen and where its impact will be felt. Protocols are already in place and, although the sun may surprise us with an eruption that could disrupt my iPhone's emoji updates or jam air traffic communications, for the most part, we're on it. The same rationale goes for the "potentially dangerous asteroids and comets" threat they identify. We have observatories in space and on Earth right now detecting and tracking scary space rocks. As our technology and observing techniques improve, we're getting better at detecting these things. It's hard to see what Asgardia will do any different apart from building more observatories — which, in principle, would be great. But if they're thinking about building mega lasers or some other ordnance to vaporize incoming space rocks, I can't imagine the United Nations being cool about an orbiting weapon that could be used, potentially, to wipe out London, New York or Moscow. If the main premise behind Asgardia is the demilitarization of space — one of their founding principles — this would be a huge contradiction. But what about the ever-constant threat of being blasted by "cosmic radiation from nuclear reactions in novae, supernovae and pulsars" I hear you cry! This "threat" is just pandering to a doomsday theory that holds very little water. Yes, cosmic events like gamma ray bursts (basically badass supernovas) are known to unleash huge quantities of energy when they explode, but they are extremely rare over human timescales and we'd have to be crazy unlucky to be in the firing line. But if thevanishingly small chance of a CMB blast to Earth's face did happen, besides erecting a planet-sized indestructible space umbrella, there's nothing we — not even the almighty Asgardia — can do about it. Cosmic radiation hits our planet all the time, everything from high-energy cosmic rays from deep space to the ions that our sun produces. For the most part, our planet's atmosphere and magnetosphere already provides great protection. But just in case you thought the project couldn't get any more bizarre, you were wrong. Asgardia is going to defend us from aliens — an alien infection, to be precise — by alerting us to the "danger of Earth infection by microorganisms from meteors and other small celestial bodies." Let's put aside the fact that we have no idea if there's life anywhere else in the universe except for on Earth, but identifying meteorite germs as a "threat" to Earth is a pretty big stretch. RELATED: Will Earth 'Be Wiped Out' by a Supernova? That's not to say astrobiologists haven't thought about this, however. "Panspermia" is a fun hypothesis that describes a mechanism that could spread life from planet to planet. Should Earth, say, get hit by a massive asteroid strike, some bacteria-covered rock could be blasted into space. If this rock then lands on Mars as a meteorite, perhaps those Earth bacteria can set up home and evolve new life on another planet. And this works both ways; what if a germy Mars rock landed on Earth? Alas, there is currently no evidence that life can be transferred to other planets in this way. We do, however, know that Mars meteorites have been found on Earth, so we know that rocks can be transferred from planet to planet in our solar system, but saying organic material (let alone living alien microbes) can survive the trip (that would take thousands to millions of years to complete) is extremely unlikely. Besides, NASA already has a Planetary Protection office that not only oversees rules and protocols for preventing terrestrial bacteria from hitching a ride to other planets on our robots and astronauts, they also work to prevent the hypothetical transmission of extraterrestrial "germs" being released into our biosphere. This isn't a "threat" as Asgardia paints it, this is, for now, science fiction. Many of the threats Asgardia want to protect us against are either at the bottom end of the risk scale or we already have scientists working on it, but the premise that this nation will represent all of humanity seems problematic. On the one hand, Asgardia says that going to represent the whole of humanity in an effort to strive to demilitarize space, while not being answerable to any one nation. It will have its own laws and ways of doing things. 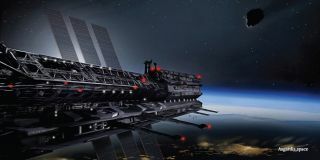 But to make Asgardia a success, the founders say, "the first Asgardians will be those who work in the fields of space research and exploration, and space technology, as well as investors in these fields, including small investors." If Asgardia is to represent the whole of humanity, it's already facing a conflict of interest. This project would need massive investment (on what, it's not clear at this stage), but founding a nation where investors and science-minded folk will be accepted from the outset seems like an exclusive club (especially as the initial influx of wannabe Asgardians is being capped at 1 million), not a nation built on equality. The recent Matt Damon sci-fi movie "Elysium" comes to mind, where a massive orbiting space station is occupied by the rich and fortunate whereas a dystopian Earth festers under totalitarian rule. Even if this isn't what Asgardia strives to be, in its current format, it favors special interest groups and not the free-for-all that is being advertised. Although finding peace in space is an admirable concept, Asgardia promises too much. While it might make a good sci-fi plot line, it's going to do little more to protect Earth from space hazards than we're already doing. At worst, it will create more segregation where a few of the "lucky ones" can become a member of this philosophical space station club to escape the status quo here on Earth.